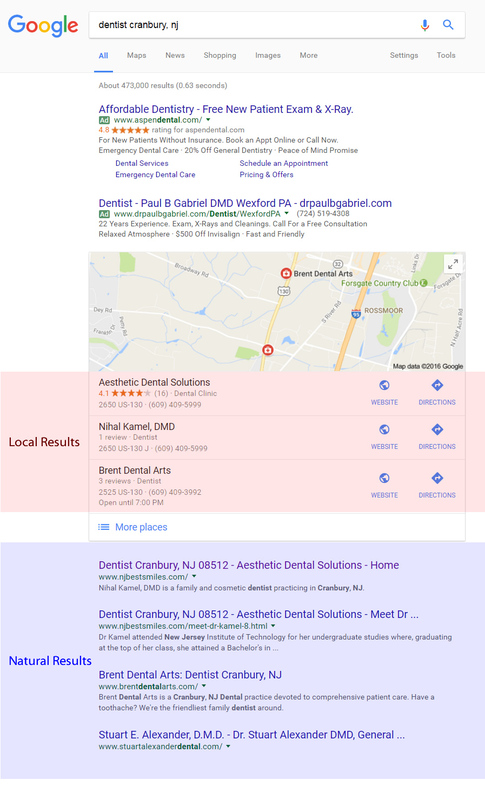 When it comes to building websites that produce results, Dental Web Services has a proven track record in achieving strong search engine optimization. Our highly effective online strategies mean your dental practice will show up where it matters when patients do an Internet search for dentists in your area or in your area of expertise. There is a lot of buzz these days about Search Engine Optimization (SEO) and how it works. Fact is the criteria change all the time, along with the ever-evolving technology of the Internet. In a nutshell, SEO is the practice of using various techniques to get your website near the top of the search engine's results page. This includes (but is not limited to) using various coding techniques with your website's keywords, using the site map standard, and making all links visible to search engines. The good news is when you partner with Dental Web Services, you needn't worry about how it all works — that's where we come in. Our Google-trained search specialists will submit your website address to various search engines and will optimize your site throughout, from visible copy to background tags, to improve your search results. It's all part of the comprehensive package we offer dental practices. Thanks to our expertise, we're happy to report that more than 250,000 appointment requests have been received on dental websites designed by Dental Web Services. When people type in certain words in their Internet browser's search box, websites come up as "hits" or matches to the search words or phrase. These listings are referred to as "organic," "free" or optimized listings, the ones that search engines recognize as most relevant to what was entered in the browser search box. It can take several months for a website to come up in an Internet search so give your website time to work its way up the list. The Internet is a very crowded field so it's important to have your website coded correctly and with the competitive edge needed to yield good search results...results you'll get with Dental Web Services' online marketing techniques. There are several ways to be found on the Internet. Anyone who has ever done a search has seen websites come up in several places — at the top, on the side, clustered together near a map, or in directory listings. Dental Web Services will work with you to achieve the search engine results you seek in a number of ways. Google's local directory listings appear next to a map with basic contact information (see placement below). At Dental Web Services, we focus on getting your website listed on the first page by using under-the-hood techniques. There is also much you can do to get to the top. Please call and ask about what you can do to improve your ranking. Google does not charge when users click on these links. The natural results (aka organic results) appear below the ads and local listings (see placement below). Dental Web Services uses the latest Internet technology and search engine optimization tactics to achieve powerful listing results on the web. Your website's coding, title tags, meta tags, links, keywords and much more are part of the SEO formula that helps you get noticed on the Internet. Google does not charge when users click on these links. Give us a call at (800) 570-8562 and we'll explain how it works.